The 13th Annual Smart Hustle Small Business Conference with Seth Godin takes place on Nov 8, 2018 - http://www.smarthustle.com/conference. We wanted to give you a taste of what to expect and MORE at this year’s conference. 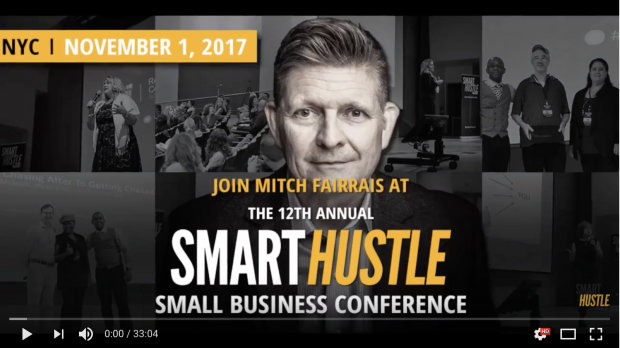 As we invite you to join us at our 2018 Smart Hustle Small Business Conference, here is a recap of what one of our 2017 speakers, Mitch Fairrais, President and Founder of training company On The Mark http://onthemark.ca/, shared with the audience. Mitch presented how to move people from where they are (point A) to where you want them to be (point B) and leave them “feeling understood” in the process. Mitch shared how professionals, managers and business owners can not only improve your business interactions, but also how to get the most out of life in general. Mitch used the phrase “Tu casa, mi casa,”(Your House, My House - a twist on the classic Spanish phrase meaning My House, Your House) to highlight the importance of being willing to leave our own opinions at the door and focus on what the opposite party is presenting. He emphasized the great value in taking the time to LISTEN to the people around us, whether they be clients, coworkers, or family. In order for others to understand and take our points into consideration, we must first take a look at what they have to offer and take time to comprehend their point of view. Mitch also used various stories and life experiences to bring to light different aspects of listening and how we can be better listeners as we walk into meetings, talk to clients, or just interact with the guy next door. With a curated mix of networking, main stage presentations and sponsors the conference is an oasis of practical insight for entrepreneurs hungry for growing their businesses.